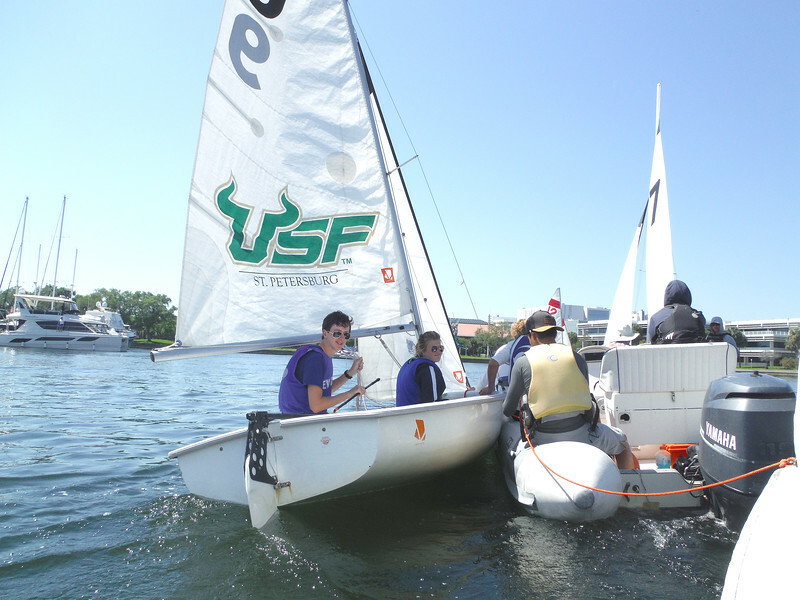 Clinton Overton (Captain) and Anna Feldbush (First Mate) are shown here during a recent intercollegiate regatta in St. Petersburg. The pair took second place in every race they entered March 30 at the Lake Virginia Invitational hosted by Rollins College in Winter Park, Florida. The New College sailing team has been riding a wave of success this year, thanks to a core group of dedicated students. “We’re out most weekends,” says one of the team’s captains, Renbourn Chock. In addition to practicing three days a week, the team has participated in seven regattas since the fall semester began and five since the beginning of this year. This past weekend, Chock and teammates Clinton Overton, Anna Feldbush and Michelle Guyette took second place at the Lake Virginia Invitational hosted by Rollins College in Winter Park, Florida. Participating teams included Rollins, Palm Beach Atlantic University, the University of Central Florida, and the overall winner, Embry-Riddle Aeronautical University. Other team members include Lydia Dykema, Evan Hunter, Lucas Rencker-Usui, James Parker, Olivia Lowrey and Daria Paulis. The team has a common goal to accomplish that. Chock hopes to bring students and key members of the administration together to come up with some goals. Although their racing season is over for this semester, there are ways to still be involved. The team practices at the Caples waterfront on Wednesdays, Fridays and Saturdays and may host a “Learn to Sail” day in the near future. More more information, visit the New College website or view the team’s Facebook page. — Jim DeLa is Digital Communications Coordinator in the office of Communications and Marketing.